This delicious and healthy egg dish is a fun way to celebrate Easter and, best of all, it looks as good as it tastes. Spoil your kids with this Easter treat, or better still, involve them in the preparation! 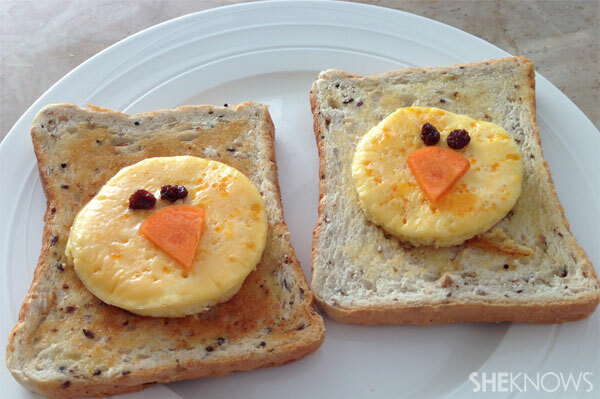 This fun and healthy Easter breakfast recipe serves four, although you can adjust the ingredients to make more or less. Place frypan on a medium-high heat and add a little olive oil spray. Mix eggs, milk, salt and pepper together in a bowl, whisking until eggs are light and fluffy. Spray the egg rings with olive oil spray (so the egg mixture doesn’t stick to the sides) and place on the frypan. Spoon in enough egg mixture to reach the top of the egg ring, then add the lid to the frypan — this hastens the process and helps to cook the eggs on top as well, so you don’t end up with rubbery, hard eggs on the bottom and soft eggs on top. Allow to cook for around 4 to 6 minutes, until the egg is cooked right through. While the eggs are cooking, cut four thin rounds/slice from the carrot (around 1-millimetre thick). Cut each round into a triangle shape to resemble a “beak”. Carefully remove the egg ring from each egg using tongs, then transfer the egg to a piece of hot buttered toast. While the egg is still warm, add the carrot beak and two sultanas for eyes. Repeat the cooking process for two more eggs and serve on a breakfast tray with fresh juice and a chocolate Easter egg!